In Houston, Third Ward’s Chopper Club teaches artistry along with basic machining and welding skills. Posing with club members are Benjy Mason (left) and Zach Moser, both ’02. In an inner-city neighborhood of the sprawling, car-choked city of Houston, four Oberlin alumni are leading a bicycle revolution. 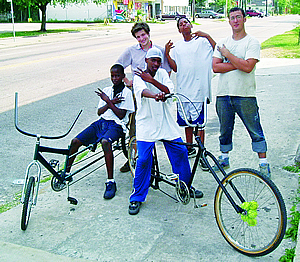 Seth Capron, Katy Goodman, Benjy Mason, and Zach Moser, all members of the Class of 2002, are founders of the Third Ward Community Bike Center, a lively nonprofit that teaches neighborhood residents how to make and repair their own bikes. Third Ward is one of several bike centers around the country—such as the Bike Kitchen in San Francisco and the Ohio City Bicycle Co-op in Cleveland—founded by former students who worked with the Oberlin Bike Co-op. Based in the basement of Keep Cottage, the student-run learning center was founded in 1986 as a place for students and townspeople to construct and fix their own bikes. Third Ward promotes bikes as an affordable means of transportation. Drop-in sessions, after-school programs, and even an Earn-a-Bike Program teach kids both to fix their own bicycles and to build bikes for themselves and local charities by using old parts. Services are free and attract about 200 people monthly; 70 percent are children and teens. The program isn’t just about bikes, however. “We’re not bike activists,” explains Moser. “Our main goal is to build community and empower kids by giving them access to a decision-making activity. Bikes are just the things we started with.” More educational programs are down the road: expansion plans call for classes in silkscreen and sewing, plus the creation of a local clothing label for youth to market garments they make themselves. Empowering kids through hands-on projects was a philosophy developed by the four Obies as organizers of community activities in Oberlin, such as the Big Parade. Begun by the group in 2001 as a way to facilitate youth-led projects, the parade has evolved into a yearly Oberlin tradition involving 1,500 participants and spectators. Yearning to continue their work after college, the alumni set off for Houston, where Moser’s newly won Compton Mentor Fellowship Grant provided $20,000 in startup funds to establish the bike center. All four lived in a two-bedroom apartment for a year until other grants and donations allowed them to draw modest salaries for the full-time work.